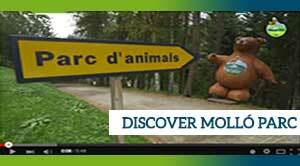 Molló Parc, opened 361 days of the year! Last entry is two hours before closing time to allow time for the whole itinerary. 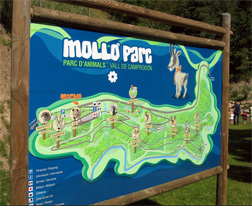 Molló Parc, The animal park of the Pyrennes, is not a zoo or a theme park. It is a Natural Park located in a forest where the excitement comes from its own space and through its fauna and flora. 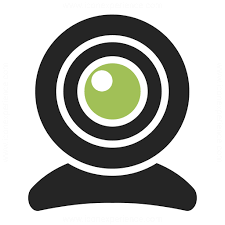 Moreover, the visitor is not a simple spectator, but a creator of their own outdoor itinerary while walking through the woods and fields at the heart of the Valley of Camprodon. Molló Park takes up an area of 10 hectares within the municipality of Molló (Ripollès) and is about 600 metres from the town centre. The park offers its visitors an itinerary through which you can enjoy nature for 2 or 3 hours. 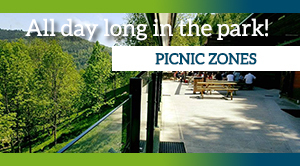 However, if the visitors want to spend the day, Molló Parc has rest areas and a café where hot or cold sandwiches, soft drinks, coffee and ice creams can be bought to eat in the picnic area. This itinerary allows you to walk between red deer, fallow deer and roe deer, to see how they feed and rest, how they interact, play and take care of their young, among other things. Likewise, the park guides the visitor to the caprine area, with the Hispanic goat, and other areas where mouflons, bears, chamois and marmots can be observed. Nature lovers, hikers, mountaineers and the public, with young children and teenagers, meet here at Molló Parc, for whom various educational and cultural events have been prepared. This way, during the itinerary and through several activities, the visitor can appreciate the flora by learning to distinguish pine trees, oaks, holm oaks, ash trees, holly trees, poplars, beeches, etc. ; and to enjoy its fields and the charm of mixed Pyrenean woods.